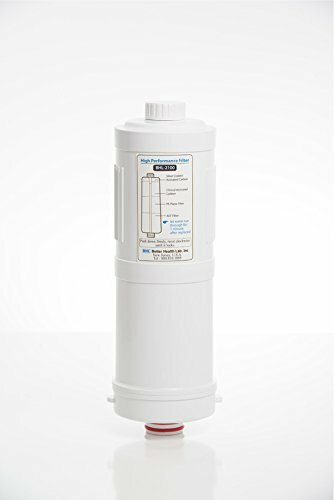 The Filter BHL-2101 filter fits the BHL-2100 Water Ionizer. The best filter materials are employed to achieve a more than 99.999% efficiency rating in removing harmful parasites such as cryptosporidium. Chlorine and toxic chemicals are also efficiently removed for up to 1000 gallons of water use. Lead reduction is greater than 98%. The Premium Series Purification Filter Replacement Cartridges are constructed of 100% FDA approved materials. Materials are tightly packed into a sixty cubic inch filter to prevent channeling. These cartridges are used ONLY for the BHL Water Ionizer. Manufacturer: ALKAZONE / Better Health Lab, Inc. Publisher: ALKAZONE / Better Health Lab, Inc. Studio: ALKAZONE / Better Health Lab, Inc. If you have any questions about this product by Alkazone, contact us by completing and submitting the form below. If you are looking for a specif part number, please include it with your message.